This 20th Annual Charity Event is a fundraiser for BFW Charities that raises money to help familes and individuals in need...Learn More. BFW Charities is a non-profit 501c3 organization dedicated to health research and providing grants, services, and basic home furnishings to people in our local communities, as well as abroad. 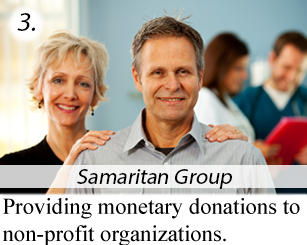 The organization operates through three dynamic programs: Medical Research and Grants, Furnishing Achievements, and the Samaritan Group. Each year, BFW Charities impacts the lives of hundreds of people. In 1993, Doug and Julie Huseby, founders of Becker Furniture World, established BFW Charities. It started with community requests from individuals who knew of people who where in need of basic home furnishings. Families were without kitchen tables, and children were sleeping on the floor. The Husebys met these basic needs and formalized their endeavor by creating BFW Charities non-profit. It is the goal of BFW Charities to help families not only have their physical needs met, but also that they provide the skills they need as they journey toward self-sufficiency. The charity expanded into Complementary Medical Research and Education as Doug saw how more needs could be met. He has studied options for him and his family to stay healthy and avoid the pain and suffering of acquiring deadly illnesses prematurely, along with finding solutions to help avoid getting sick with the latest “bug” going around. In 1987, Doug lost his mother as a result of an operation that he felt could have been avoided if the options of complementary medicine and therapies would have been available. Since her death, he has watched countless friends and family members suffer, only to lose their battles. These events launched a deep and intense passion to learn more about medical options, including complementary medicine and therapies. The Charity tries to give options to individuals who may not be able to access these advanced technologies and care protocols. I know that most people want to do more to help people in need however, many times, the dynamics of life do not allow people the time or resources to accomplish their vision or goals. I would like to request your help in forming a partnership to accomplish the goal of helping people. I have set up a non-profit organization that I feel helps people that have great needs which are not fully being met by society. I invite you to view this website and learn how you can become a vital part of helping those in need both in America and abroad.